The importence of knowing Elohim’s (God) calendar. is high in the list of things. without this foundation. alot of scripture is harder to understand. Prophecy and the signs that are being sent by Elohim right now dont make much sense. unless we are on his calendar. Signs in the sun, moon and stars. 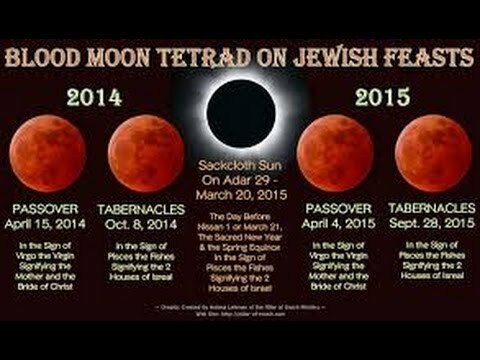 prehaps you have seen or heard of the blood moon tetrad that have been signed to us on His Kodesh seasons. over 2014 and 2015. the last of which in this set of signals, is to happen on Elohim’s appointed time of the feast of Sukkot (Tabernacles) It is very important for us as the body Messiah. To understand when He is trying to send us a message. even if its a message to keep our eyes open and stay vigilant. Have a look at the video where mark biltz explains his discovery. 23 Then Yahweh spoke to Moses, saying, 2 “Speak to the Israelites, and say to them, ‘The festivals of Yahweh that you shall proclaim are holy assemblies; these are my appointed times. 3 “‘For six days work is to be done, and on the seventh day shall be a Sabbath of complete rest, a holy assembly; you shall not do any work; it shall be a Sabbath for Yahweh in all your dwellings. 9 Then Yahweh spoke to Moses, saying, 10 “Speak to the Israelites, and say to them, ‘When you come to the land that I am about to give to you and you reap its harvest, then you shall bring a sheaf of the firstfruit of your harvest to the priest. 11 And he shall wave the sheaf before Yahweh for your acceptance; the priest shall wave it on the day after the Sabbath. 12 And on the day of your waving the sheaf you shall offer a yearling male lamb without defect as a burnt offering to Yahweh. 13 And its grain offering shall be two-tenths of an ephah of finely milled flour mixed with oil, an offering made by fire for Yahweh, an appeasing fragrance; and its libation shall be a fourth of a hin of wine. 14 And you shall not eat bread or roasted grain or ripe grain until this very same day, until you present your God’s offering. This must be a lasting statute for your generations in all your dwellings. 33 Then Yahweh spoke to Moses, saying, 34 “Speak to the Israelites, saying, ‘On the fifteenth day of the seventh month, this shall be the Feast of Booths for seven days for Yahweh. 35 On the first day there shall be a holy assembly; you must not do any regular work. 36 For seven days you must present an offering made by fire to Yahweh. On the eighth day it shall be a holy assembly for you, and you shall present an offering made by fire to Yahweh; it is a celebration; you must not do any regular work. 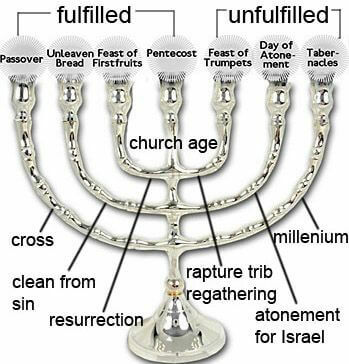 37 “‘These are Yahweh’s festivals, which you must proclaim, holy assemblies to present an offering made by fire to Yahweh—burnt offering and grain offering, sacrifice and libations, each on its proper day 38 besides Yahweh’s Sabbaths and besides your gifts and besides your vows and besides all your freewill offerings that you give to Yahweh. 44 Thus Moses announced to the Israelites Yahweh’s appointed times. I have a question here in regard to the dates you have listed above, Passover/Shavout especially being the two I’m referring to most. Torah calendar.com has a pre-set calendar with the dates all filled in years in advance. This year, however, two witnesses came to the Saduccees and said Abib started in early March (10th), almost a month earlier than their planned calendar, which affected their date-setting. According to Scripture, Pesach/Passover, is to be 14 days into the month of Abib, and Abib is to be determined by two witnesses who state the barley is ready. Two witnesses came, rabbinical folks were excited as it had been over 2,000 years since this had happened, yet refused to alter their pre-set calendar to reflect this. Because of this, it also throws off Shavuot/Pentecost. We had our Pesach according to Scripture, based upon the testimony of the two witnesses, and we’ll do Shavuot the same way. But isn’t this error and stubborn refusal to adhere to Scripture going to throw off the rest of this pre-set calendar too though? I have not heard anything about this and i will have a look into it. Hope this helps. We’re still fairly new to all this, and we want to make sure we’re getting the timing correct at the very least. Thank you for your assistance!